Located in one of Beijing’s busiest hutongs (narrow alleys) in the Dongcheng district of the city, Salud’s exterior looks traditional Chinese, while its interior is anything but. A multi-level bar with a decidedly European style and an international drinks list makes Salud a popular hangout with tourists and locals alike, especially on the weekends. The ground-level bar area is reminiscent of a Spanish tapas bar, which is obviously what the owners were going for as Salud does in fact serve a small food menu of tapas-style sharing plates. 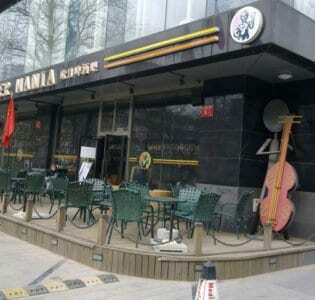 But it’s the drinks and the atmosphere that attract the repeat business, as well as perhaps the regular live music and themed events (the Beijing Beatles cover band like to frequent Salud, and at Christmas, don’t be surprised to see a sea of red Santa suits inside the bar). The drinks list is fairly extensive, mainly focusing on classic cocktail concoctions. Alongside martinis and manhattans, there are seven different styles of mojito, and a range of fruity margaritas – both frozen and straight up. There’s also a decent selection of single malt and blended whiskies, some draft beer (both local and either Belgian or German imported labels), and sangria for the balmier evenings. The most popular libation, however, is Salud’s range of infused vodkas, which come in flavours ranging from Sichuan peppercorn to grapefruit & ginger and are served by the glass, bottle or “metre of happiness”.